At Larsson's storehouse, storemen Hansson and Karlsson maintain rigorous control over cardboard boxes and numbers. They in turn are kept under constant surveillance by the Director via the telephone on the wall. Life follows the established routine, day after day, year after year, until this particular day when Hansson and Karlsson make a fatal mistake and suddenly find themselves with two boxes numbered 18. Or is it 81? Or are there two numbers, but which is which? The story that is now enacted at the storehouse is about The Boxman, who finds a clown mask in a box and sees the world through a clown's eyes. Another box contains a puppet circus, a toy world in which his great - yet impossible - love for the little tightrope walker is aroused. But our story, about the Boxman's great longing for someone to share his box with, doesn't end here. Deeply concerned about the Boxman's plight, Hansson and Karlsson open yet another box and discover The Boxwoman. As in all good stories, this one too has a happy ending. In their toy heaven the tightrope walker and the toy clown are united. Boxman gets his Boxwoman and Larsson's storehouse will never be the same again. The Storehouse Story doesn't comply with normal notions of puppet theatre. In our play, apart from using traditional puppets, we make so bold as to construct the main character from simple cardboard elements, animate objects and involve ourselves in the action. Boxed-in by the form, both we and the puppets are eager to break loose! The Storehouse Story is intended specially for children aged 6 - 11 years old, but even if you're older, we can promise you a wonderful experience! Puppets and set were designed and constructed by Anders Lindholm and Cecilia Billing, who are also the puppeteers. Many thanks to Juan Rodriguez for dramaturgy advices, who has recently directed for Riksteatern (the National Swedish Touring Theatre) and Blekinge Regional Theatre, Kronoberg. Rigging time: I hr 15 min. Blackout: Full blackout facility is required. Electricity: Regular 10-Amp wall sockets. The Swedish Theatre Biennial's citation on A Special Day at Larsson's Storehouse. The Osby Puppet Theatre Workshop employs great artistic integrity and inventiveness, addressing their audience intimately but not ingratiatingly. In Larsson's Store puppets work alongside full-blooded actors: gossamer dreams, drastic humour and sheer cardboard poetry are all encountered with a subdued, almost stern tone of voice. This week at Pygmeteatern you can see the devil. He appears briefly on stage but otherwise makes his presence known via Dockteaterverkstan's devilishly invigorating effects. The fact is that A Special Day at Larsson 's Storehouse is a minor sensation. Cecilia Billing, Anders Lindholm and their director Juan Rodriguez do everything that all theatre should do: astound, fascinate, concentrate and examine. Hansson and Karlsson are two forgotten, brown-coated, diligent employees at Larsson's Store. One day they happen to open a box, from which a friend appears. This is not just any old friend: it's Boxman, a loosely assembled figure with a firmly fashioned character, who could have been drawn by Picasso. What's more, when he loses his heart to the little mechanical tightrope dancer, it's like Cubism embracing Hans Christian Andersen. And, as in Andersen's story about the tin soldier, here too a heart gets scorched by fire. But when the tightrope dancer goes off to the toys' heaven Boxman has to stay behind among his earthly cartons. And lo and behold, out of the cardboard emerges at last the Boxlady of his dreams. Dockteaterverkstan seem to be constantly seeking forms of expression we can scarcely even imagine before they become perfectly natural in the hands of Cecilia Billing and Anders Lindholm. There is a playful heightening of tone; a store-box theatricality that is nothing less than art. In their one-hour show Dockteaterverkstan demonstrate what the critic never really manages to put into words: the radiance of a powerful theatrical experience. This is the magic that causes time to stand still and makes the audience realise that there are still reasons why adults and children alike should turn out en masse even for a small theatre company. No one is too big for Larsson's Storehouse by and with Dockteaterverkstan. The two-person ensemble from Skane is playing at Pygmeteatern in Stockholm and voild\ Small-scale total theatre in snuff-brown Store design that packs humour, love, hate and passion all into the same cardboard boxes. Over the years with Dockteaterverkstan, Cecilia Billing and Anders Lindholm have created well devised and executed performances, with puppets of high artistic and technical quality. 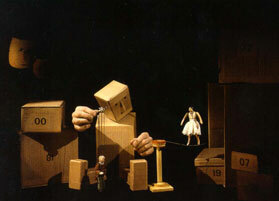 In Larsson's Storhousee they blend their own acting with exquisite puppetry, allowing "cubist" box characters to meet both a classic devil and a toylike tightrope dancer. Into the everyday routine of the store drifts a whiff of the fairground, barrel-organs and clowns. The contrast between the ordinary, dreary lunchbox and the enticing world of the circus is exploited imaginatively, unexpectedly - and with humour! Despite the sorrowful fate of the tightrope dancer, it is the smile which prevails, particularly that of Cecilia Billing's capable and dependable angel. And all's well that ends well; the box man gets his four-square lady. Director Larsson takes a holiday with his former childhood sweetheart, Julia the tightrope dancer. Old Hans ChristianAndersen gets stuffed into a Monty Python circus canon and - boom! What a great little theatre! There's a guest show at Pygmeteatem: Dockteaterverkstan's A Special Day at Larsson 's Storehouse. With sophisticated artistry and exquisite handicraft DTV presents puppet theatre that's full of poignant detail. At the store, Hansson and Karlsson - puppeteers Cecilia Billing and Anders Lindholm - are engaged in sorting and piling cardboard boxes with scientific precision. Suddenly the boxes come to life. A boxman is bom, curious to discover his surroundings. He is captivated by a delightfully graceful tightrope dancer from the nearest box circus. But fate trips up the circus princess who is transformed into an angel in the toys' heaven. The boxman finds solace in a boxlady. Director Juan Rodriguez has shaped a concentrated, rhythmical performance, that is secretive and magical, creating its own theatrical world of play. Theatre for children and young people was strongly represented this year too. The pearl of the Biennial was Dockteaterverkstan's A Special Day at Larsson's Storehouse: a bashful, timid little show from Osby which, with the help of two eminent puppeteers, grew to true theatre magic. Swedish young people's theatre continues to impress. Far from always, but when it's good it can be magical, as with A Special Day at Larsson's Storehouse by Dockteaterverkstan from Osby. For many, the greatest experience of the Biennial. DOCKTEATERVERKSTAN - Prästavägen 7- 283 42 Osby - Sweden.